Why have a wedding magician at my reception? Isn't magic just for kids? A wedding magician can bring an extra element of fun to any event but even more so to a wedding party. At most weddings I've been to there are two families, with their friends, brought together, often for the first time. People are mixing with others that they've never met before to celebrate your special occasion. So of course there's a little bit of reserve and an awkward moment as your guests arrive and start to mingle. Thats the time when I will jump in and start to perform some close-up magic, strolling from group to group. This acts as an ice-breaker to get your party started. I also engage any children who may be at your reception as they are usually the most interested in magic. I show them tricks and give them impossible things to do. Once I get their attention and a buzz of interest starts the adults get sucked in too and pretty soon people are asking each other 'how did he do that' or 'did you see what he just did', or 'come and show Auntie so and so that trick you just did'. By the time your guests are seated for the wedding breakfast, most of them are already primed and know what to expect. They know they are in for some fun. I wait until the starters have been cleared away and then come up to individual tables, trying not to get in the way of the serving staff. I don't normally perform whilst there is food on the table and people are still eating! The effects I can do at a table can be different (it can help for some tricks to have a table to put things on). I will select certain people usually the ones that I can tell are up for it. Just occasionally I meet people who are not interested and I respect that fully. I'm not going to force magic on anybody. Although I've selected an individual or a couple to perform an effect with, I'm usually performing to the whole table and I will often go round a table showing different people the same effect if its appropriate to do so. It can be difficult for me to get away to the next table sometimes as usually some wine has flowed and people have relaxed a bit and are ready to be entertained! I'm not a comedy wedding magician but I do like to have a bit of banter and a bit of a joke with people. What I won't do is to set out to embarrass anyone or make them look foolish. The name of the game is to have fun but not at anyone's expense. Recently I've found children at a reception party who are really into magic and if I can I will use one of them as an impromptu assistant. 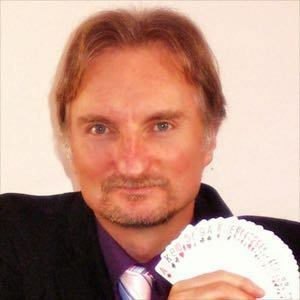 I have a card trick which is perfect for letting them do most of the work and of course taking the credit, without them knowing how they did the trick! The best tricks, I reserve for the top table. By then I might have a new assistant with me! Can you saw someone in half? No. Although I do have an effect where some soft cords are made to pass through the spectator's hands (without injury I hasten to add). That is the closest I get. Some very small children may feel nervous about this effect so I am quite sensitive to the possibility of them being nervous and may demonstrate it on an adult first to prove it is safe. Once I've done that then the children usually want me to repeat the effect over and over! No I don't. I feel it does't suit my style and is probably not appropriate for my favourite environment which is a wedding party. I occasionally ask to borrow items but all items are returned intact. Again - this doesn't suit my style (although I am tempted to try and learn). Absolutely. I am always happy to meet up in a bar in York or nearby and demonstrate some effects, discuss timings, venue etc. Just give me a call or send me an email to arrange a demo. Most of my bookings come from the immediate York and surrounding area. That's because I promote myself at wedding fairs in the York and North Yorkshire area but I have also performed in many other areas of Yorkshire and occasionally as far afield as Bristol and Cornwall. There is definitely a cost benefit to booking locally as I won't have to factor in travel and overnight stays if I am booked for an event in or near York. Where have you performed your magic? Venues include: The York Hilton, The Marriott Hotel, The Monk Bar Hotel, Hazlewood Castle, The Pavilion Hotel, Fulford, Churchills Hotel, Burn Hall, Aldwark Manor, The Hospitium, The Merchant Adventurer's Hall, Sandburn Hall, York Racecourse, The National Railway Museum, Chiquitos, Fairfield Manor, Biltmore Bar, Rowley Manor, Barley Hall, The Parsonage at Escrick, St William's College, Solberge Hall, Middlethorpe Hall, The Grange Hotel, The Morritt Country House Hotel, Hotel du Vin, York's Chocolate Story, The Golden Lion in Northallerton, Kellington Manor Hotel, The Wensleydale Creamery, The Crown Hotel Harrogate, The Palm Court Hotel, Scarborough, The Alice Hawthorne gastro pub, The Holiday Inn York, Rotherham Golf Club, Crewe Hall Hotel, Woodhill Hall, Otterburn, The Friars Head in Akebar plus numerous private houses, marquees, village halls, various old people's homes, Driffield Showground, The Great Big Welly Fest, an RAF base and an Army base. How long do you perform magic for? The answer is that it varies quite a bit but the short answer is for as long as there seems to be a demand for my entertainment. That can range from a couple of hours to 4 or 5 hours. If people are up for it, I can keep going for several hours. So it depends a bit on what else you have planned. I can't compete with a loud disco for example as I need to be able to talk to people but sometimes there will be a disco going on in one room and I'm doing magic in another. How will I know that you are any good? Please review my testimonials. They are all genuine comments that have been e-mailed to me or said to me directly. I am also a member of the International Brotherhood of Magicians. If that still doesn't convince you then give me a call and talk to me about arranging a free demonstration. It depends. I will try and gauge what is appropriate to the occasion and dress accordingly which usually means either a lounge suit or DJ. At a wedding I will always be in a suit and tie, if not a dinner jacket.